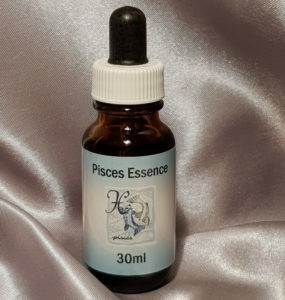 Pisces Essence is the final essence in our Star Sign Range. The twelfth sign of the zodiac Pisces the Fish (20th Febraury – 20th March) represented by two fish swimming in opposite directions while tied together at the centre to represent the vacillating, fluid nature of Pisces. Pisces is the sign of intense emotional sensitivity, desire for togetherness and absolute, mystical or religious love. Pisceans can be idealistic and unable to face reality, which sometimes leads to irrational behaviour. Karma in the Piscean sphere centres around the sign’s tendency to play the saviour or victim, taking on atonement rather than at-onement. The karmic challenge is to learn to empathise without taking on someone else’s pain.